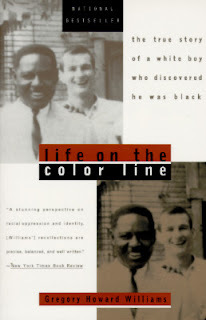 The premise for the autobiography Life on the Color line: The True Story of a White Boy Who Discovered He Was Black seems unbelievable and readers may question how author Gregory Howard Williams could not know he was black - he would only have to look in the mirror to see his skin colour. Reader's learn that the author's father. Buster Williams had "passed," or looked pale enough that whites did not realize that he was black. By marrying a white woman and running a successful business Buster did well in white society. Eventually the author's parents divorced, and Buster took Gregory and his brother back to his hometown to live with their grandmother. The boys had not been told that they were black. Instead they had been led to believe by their parents they were Italian; consequently, the boys learnt on the train ride to Muncie, Indiana, their father had been "passing". Describing that moment the author remembers thinking; I'm white! I look white! I go to "whites only" school,'whites only" movie theaters and "whites only" swimming pools! I bad never heard anything crazier in my life! How could Dad tell us such a mean lie? "I saw my father as I had never seen him before. In my .eyes he was transformed from a swarthy Italian to a high-yellow mulatto." This book is a good source of information about the social conditions of blacks in the United Stated during the 1950s and '60s. Gregory Howard Williams and his brother had the unique experience of living in two different cultures, and experienced first hand how whites were more privileged. Blacks in the United Stales were segregated from the rest of society in lower paying jobs. In public places such as buses and swimming pools they were not allowed in the same areas as whites.The author describes his frustration at not being able to do the things that he had grown up doing, such as sitting at the front of the bus. The father's story about passing as a white person would also be interesting to the reader. As well as wanting to learn more about William's grandmother. Miss Sallie and how she felt about being a cook at her own son's restaurant and being unable to acknowledge her own child and grandchildren. The author also leaves the readers hanging because even though he writes about what be and his brother and a few of his friends are currently doing, he doesn't describe his present relationship with his mother's side of the family and whether he has any contact with them. Gregory Howard Williams' book is easy to read and gives readers a glimpse into a boy's experience of having his life turned upside down.